Cambridge Court World School is committed to the total development of students’ minds, hearts, and bodies. Yet first and foremost, we work diligently to maintain a reputation for academic excellence. Our rigorous, concept-based curriculum develops intellectual and cultural competence, emphasizing creative problem-solving and experiential learning. We incorporate research-based, best practices into our daily instruction to help all of our students to be as successful as possible. At Cambridge Court World School, teachers plan out assignments and assessments in such a way that it aspires students to explore. 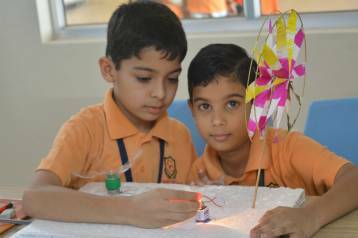 Project-based learning is an intrinsic part of curriculum and further boosts the hunger to learn. Students at CCWS always want to discover, explore and research and sometimes they end up with exceptional results. Concept based learning not only helps in academics it also trains them to lead their future life smoothly. Our high standards deliver high outcomes.